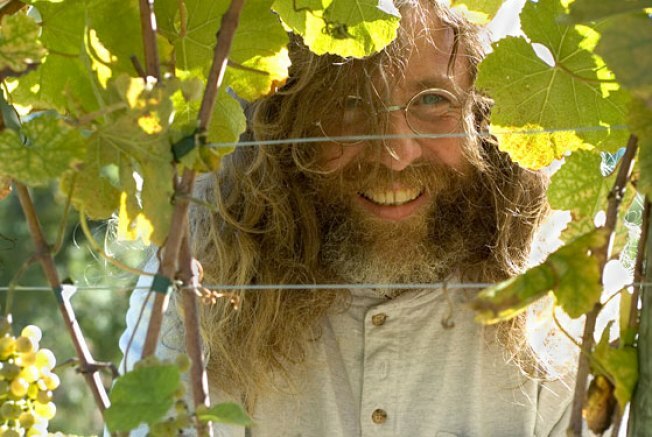 "The wine world has lost a great vigneron." Iconoclastic Loire Valley producer Didier Dagueneau died at the age of 52 in France yesterday when the small plane he was piloting crashed after a troubled takeoff. Dagueneau was best known for his maverick methods (like excessive pruning for a low yield) with Sauvignon Blanc in the Pouilly-Fumé appellation; his Pouilly Fumé Cuvée Silex and Pur Sang were highly touted. In an e-mail, the Loire Valley Wine Bureau quotes Joe Dressner, of Louis Dressner Selections, as saying, "The wine world has lost a great vigneron and the world has lost one of the most original, charming and mischievous characters to ever grace a vineyard row." The photo they sent us speaks both to Dagueneau's eccentricity and his love of the vines; Wine Spectator also published an obituary.